The REACT 350 is the industry’s most durable crash cushion for SEVERE USE sites with high impact frequency. A variety of compact units are available that meet NCHRP 350 TL-1, TL-2 and TL-3 as a redirective, non-gating attenuator. Narrow units protect hazards up to 48” wide. Wide units are also available to protect hazards up to 10’ wide. The REACT 350 self-restores after impacts, keeping the hazard protected and providing Uninterrupted Hazard Protection™. It is up to 100% reusable after design impacts and typically requires minimal repairs, if any. The system often endures repeated impacts and remains in service without the need for repairs – including common nuisance hits and bumps. The REACT 350 helps prevent accidents due to its high visibility and excellent night time guidance characteristics. 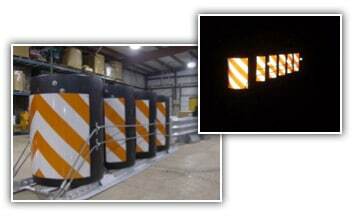 It has a large surface area for reflective material that enables multiple chevron reflectors to provide superior visibility for motorists.